The Ostroy Report: New Poll Shows it's Uphill for Hillary; More Good News for Gore? New Poll Shows it's Uphill for Hillary; More Good News for Gore? 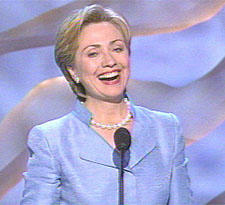 When it comes to the 2008 election, a new Marist/WNBC poll released Friday shows that America may not yet be ready for a woman president, making a potential bid for the White House in 2008 that much harder for NY Senator Hillary Rodham Clinton. According to the poll, only 26% of registered voters say they're likely to support a woman for president regardless of whether she is a Democrat or a Republican. At the other end of the spectrum, 28% would not support a woman candidate regardless of her party. 25% would support a woman if she became the Democratic nominee for president, and 21% would support her if she were the Republican nominee. Among overall registered voters, Clinton's support comes from younger females; she faces more of a challenge among age 45+ males. Among Democratic hopefuls, Clinton has a commanding lead (41%) over the pack which includes Sen. John Kerry (17%), former Sen. John Edwards (14%), Sen. Joe Biden (5%) and Fmr. Gen. Wesley Clark (3%). Former VP Al Gore was not included on the list, stating as recently as two weeks ago that he has no "intention" to run in '08. (sign our DRAFT AL GORE PETITION)*. Hillary? Hillary Who? OOOOOOh, THAT Hillary, ya mean...the one who voted for the war, has never uttered one questioning phrase that was intended to confront the jerks that waged this war, and whose only semi-brave vote was to vote against Roberts??? Oh please. If a Democrat wins in '08, the Neo-cons will impeach him again. They'll find some grounds like stealing Girl Scout cookies or something equally as offensive. I say we outsource Congress to Venezuela! Andy, no matter what Hillary does she will not get the nod. Years ago I had thought she might have a chance but now I see no chance. She has been too much on the side of the Bush Crime Family and hasn't the back bone to stand up for what is right in this country. If she was serious about running she'd come out and say her vote for the war was wrong and give the reasons why, not continue to be another Kerry, Biden, Edwards and McCain by continuing to back this war. This weekend on C-Span Sy Hersch and Scott Ritter were on and Sy made an excellent point when he said that the first candidate that comes out to be strongly against this war and was from the get-go will be a shoe-in. I believe this to be true and for that reason we can rule Mrs. Clinton out as well as the above mentioned and just start supporting Gore and Dean.